Has the entire world gone mad? The day after a Fatah suicide bomber kills three Jews in Eilat, George W. Bush approves sending $86 million to Fatah. JPost: President George W. Bush approved transferring US $86 million to strengthen the security forces headed by Palestinian Authority Chairman Mahmoud Abbas, Israel Radio reported Wednesday overnight. The White House said the funds were meant to help Abbas prevent attacks against Israel, enforce the law and promote reform. The money is transferred for financing training, purchase of vehicles, uniform and other non-lethal equipment, the White House added. Honestly, I must be living in an alternate universe or something. Wake up, O Hellenized Jew! Today three more Jewish civilians were murdered by yet another PLO suicide bomber; the very same PLO, of course, that Ehud Olmert and your liberal cronies have repeatedly given Jewish money, arms, ammunition, and land to as "Good will gestures" for peace. Ynet News: "The whole family was very happy when it heard that Muhammad is the hero who carried out the attack,"said Naim Saqsaq, the brother of Muhammad Saqsaq, who carried out the suicide attack in Eilat that killed three people. "We knew that he was waiting and praying for this moment. He always said, 'If only I could be a shahid, if only I could carry out an attack.' And here Allah gave him the privilege." What has happened, Jewish people? How has liberalism so thoroughly replaced Judaism in the hearts and minds of the overwhelming majority of my brethren? The same organization that promises they will kill Jews, and then does kill Jews, Minister Dhimmi Livni declares has the rightful claim to Judea and Samaria? We somehow must reverse this mental cancer before it gets us all killed. No longer do we as a people demand revenge when we are attacked, rather, we demand internal investigations to explain how we made the arabs hate us. The IDF then blows up a couple empty buildings for the cameras, and then the Hellenizers casually offer up more perfunctory concessions to arabs to show the world how much Jews value peace. These leftists of Mosaic pursuasion don't give a damn about Jewish life. We have become liberalized into such a fever of self-loathing that we can barely stand our own existence. We don't seek to avenge the Jews who get killed by the vermin, rather, we coddle the killers! We don't tell the world where they can go if they don't like how we take care of our business, rather, we meakly cower in the face of world opinion and western money - then hastily justify the crimes of our enemies to insure all the payola keeps coming in right on schedule. Ynet News: "He was always in the mindset of the fighters. When the Israelis were invading Gaza, he participated in the battles in Jabalya and Beit Hanoun. He was waiting for this moment. The truth is that we knew that at some point he would be killed in a confrontation with the Israelis and would be a shahid. Because of this, we are happy that God gave him what he asked for." The reality, of course is that there are no arab "partners for peace". There are only three possible resolutions to the Israel/Arab conflict. Of course, a bi-national Democracy would become a moslem theocracy or kingdom within a few hours of the vermin gaining a majority, so the only two scenarios that are legitimately tenable over the long haul are the Jewish state OR the Arab state options. Since when did we volunteer to sacrifice OUR Land, OUR people and OUR God for the terrorist god of mohammed? Since when did human sacrifice of our own blood come into vogue? The same sniveling, animal rights-liberals who would vomit in their lattes at the thought of Jews someday resuming our biblical sacrifices are only too maddeningly obsessed with sacrificing any Jew called "settler" to appease the bloodthirsty followers of the moon-god Allah. It's bad enough that we are assimilating ourselves out of existence in America. The majority of us marry out, belong to either liberal denominations or no denomination at all, have so marginalized Israel in political importance that it's survival falls somewhere between recycling and affirmative action on the issue meter, and, of course, we have such ignorance (contempt?) of Jewish law and Jewish traditions that most of us are oblivious that most even still exist at all. However, it is much worse still that in Israel the radical secularists have taken to suicidal post-Zionism: calling for their own demise and apologizing for their own existence at the expense of the "rightful" indiginous people of "Palestine": THE MOSLEMS! Already we've seen this pathetic liberalism at work today, as govenment insiders in Israel all but assured the moslem filth that no substancial retaliation would be coming from the Israeli military. So, what will it be, Am Yisroel? Are we to be casting ourselves back out of the Land and into the warm, assimilating waters of the western galut? Are we going to just allow ourselves to continue to be killed, terrorized and beaten by the wretched moslem filth who seek to take over not only Israel but the world? At some point we have to hope we wake up, look at ourselves with a clear head, and wonder what we have turned ourselves into in the name of the secular gods of Hedonism and Humanism. This secular lie we've bought hook line and sinker is not making us better, stronger or more at peace, but instead more afraid, more attacked, more demoralized and, tragically, more expendable. Ynet News: Six youngsters between ages of 12 and 15 from coastal town Bat-Yam, south of Tel Aviv, arrested for burning Israeli flag and mezuzah parchments torn from doorposts. The boys, not all Jewish, explain 'We loath anything related to Judaism'. See our future. If we do not wake up in time, at least we were warned. Moslem terrorists today received their first ever appointment to the cabinet of an Israeli government. We can be certain that this is only the first of many vermin to serve as a Minister in the Knesset, as the leftwing government is determined to turn their post-Zionism into a bi-national reality. Arutz Sheva - The government of Israel took a historic step today, appointing its first Muslim Arab Cabinet minister: Raleb Majadle of the Labor Party. His portfolio will be determined later. Israel has had a Druze minister – Saleh Tarif, who was Minister Without Portfolio in 2001-2 – but never an Arab one. While the Druze speak Arabic, they serve in the Israel Defense Forces and have been considered loyal to the state. Majadle, born 1953, is a native of Baka el-Gharbiya, an Israeli-Arab town of roughly 25,000 inhabitants in north-central Israel, near northern Samaria. His resume reads like a Zionist-socialist one: he was secretary of the Noar HaOved youth movement in his town and secretary of the Regional Workers' Council. He also served as head of the Education and Sports Department of the Histadrut - Israel's mammoth amalgamation of labor unions that was the Labor Party's bastion of political power for decades. Majadle's appointment is seen by some Israelis on the left of the political spectrum as a long overdue gesture of appeasement towards Israel's Arab minority, against which they feel Israel has unfairly discriminated for decades. Some Israelis on the political right feel that appeasement of Arabs is unwarranted and dangerous. Post-Zionist Jews believe that the only valid reason for Israel to have existed was as a safety zone to protect Jews of the Holocaust and Soviet eras from persecution. Therefore, now that such threats have been essentially eliminated from the West (for now), leftwing Jews understandably now believe that the original justification for the Jewish State to exist is no longer relevant in today's world. Thus, our current Jewish State seems, in there eyes, to be obsolete, elitest, and immoral, and must "evolve" into an inclusive liberal state without religious and ethnic preferences. Again, if the Jews are not currently being persecuted as before in the West, why should a state exist for Jews that denies equal rights to moslems? This is only reverse discrimination, right? A State born on the values of western liberalism should, and must, become a melting pot of religious and ethnic equality, for anything less would be a racist, bigoted state that goes against the most basic values of Western style democracy. In fact, won't the Europeans and Americans stop being supportive of Israel if they don't stop policies that make Israel a Jewish-first State? Isn't Israel going to risk billions of dollars in aid, plus all the perks of a comfortable western lifestyle, if the West divests from Israel for not being more welcoming of moslems? All of this is a stark reminder for us that the only rationale for Israel to exist is that the Torah tells us it's the Land the Jews were promised by God as an eternal inheritance. That we are as a people and a nation obligated by Torah to settle the Land of Israel, and that we must not allow those who are not Jews to settle this Land and rule over us. Yes, it's the truth. By biblical decree, Israel must be a State for Jews and only Jews. By any other reasoning one can argue away the need for the Jewish State to exist, and we are seeing this manifest every day in the suicidal policies of these "enlightened", Hellenized leftists currently in power having a fire sale on Jewish Land to appease the same vermin who are trying to destroy Israel and kill all the Jews. Sadly, we just took another monumental step towards abandoning self rule by appointing a moslem to head a cabinet of the government. We see this Hellenized State meakly hoping that those who hate us will somehow become benevolent once we have compassionately abdicated our thrown. Those of us who know better are obligated to speak out, to SCREAM OUT, against this tragic injustice before it is too late. OK, two corrupt Hellenized Jews and a holocaust-denying pile of rotting moslem excrement all get together in Switzerland for a "peace" conference. The first Hellenized Jew says to the putrid vat of terrorist moslem filth, "We want to give you the Land of Judea and Samaria as a good will gesture." 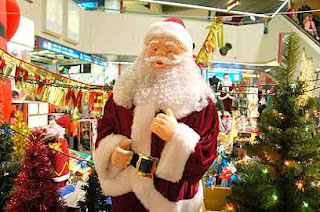 The second Hellenized Jew, not wanting to be outdone, says to the islamic heap of infected puss, "We feel it is critical that we not compromise with extremists, so we are going to expel all those subhuman Settler Jews with extreme force and gift wrap all of the West Bank for the PLO as an offering for peace." The rancid, festering, diseased, terrorist moslem boyle was taken aback by these most gracious offerings. After composing himself for a moment, he turned to the two Hellenized Jews and said, "Die all you sons of monkeys and pigs! AllahuAhkbar, the Holocaust was a Zionist myth!" Responded the two Hellenized Jews, "Thank God, we finally have a true moderate arab partner for peace!" Ynet News - Foreign Minister Tzipi Livni said Thursday that the negotiations between Israel and the Palestinian must be based on the idea of two states living side by side in peace. The meeting was also attended by Vice Premier Shimon Peres and Palestinian President Mahmoud Abbas. Has 24 "Jumped the Shark"? Between the horribly liberal shvartza president, his horrendous ACLU lawyer sister, her nauseating CAIR boyfriend, the bleeding heart counter terrorism advisor bimbo, the lovey-shmoopy terrorist-turned-peacenik Assad, and all the liberal writing of the wimpy PC storyline, MZ has determined that the hit show 24 has officially Jumped the Shark. I can't tell you how happy I am to see that my US tax dollars were spent on the terrorist moslems so they could build Saddam Street in Samaria. After all, aren't the "Palestinians" really just oppressed, kindly people who deserve a State of their own inside the boundaries of Eretz Israel? Ynet News - Palestinians in the northern West Bank have named a major street after late Iraqi dictator Saddam Hussein that was funded – along with the surrounding municipality – by the United States Agency for International Development. Following Saddam's hanging earlier this month, thousands of Palestinians gathered in the Yaabid municipality, just outside of the northern West Bank town of Jenin, to hold a vigil in his honor. According to Arabic media reports translated by Palestinian Media Watch, local Palestinian municipal leaders and members of armed factions in Jenin named a school and the municipality's main street after Saddam. The mayor of Jenin reportedly participated in an anti-American dedication ceremony in which speakers blessed the "resistance of the residents of Fallujah"
Also, a USAID-funded Palestinian sports center was named after Salef Khalef, operational head of the Black September terror organization, which was behind the killing of two US diplomats in Sudan in 1973 and the massacre one year earlier of 11 Israeli Olympic athletes in Munich. First of all, the moslem scum trespassing in the Land of Israel being given any money and weapons by the very people they are trying to kill is insane enough. However, America building Saddam Street? It would be funny if it wasn't so real. In just a few weeks, perhaps a month, we are going to see Prime Minister Ehud Olmert officially hand over Judea and Samaria to the moslems as a "good will gesture" for peace. Soon after that, God willing, Settler Jews will mobilize an army of their own, declare the independent State of Judea in what is now called "The West Bank", and fight a war of independence against the vermin just like the first war of Independence back in 1947. Of course, the war will probably also be waged against the self-loathing Hellenists of Israel, who would violently oppose such a state, but sometimes an internal war, like that fought by the Maccabees, is the only way to resolve a war against God. My money would be on the outgunned settlers, who would make up in stomach what they lack in fire power. A dandy like Olmert would surrender after the first Hellenized IDF casualty. Here is an excerpt from Worldnet Daily. JERUSALEM – Israel and the Palestinians have been conducting behind-the-scene negotiations regarding handing over most of the West Bank to Palestinian Authority President Mahmoud Abbas, according to top Egyptian and European diplomatic sources who told WND they were directly involved with the talks. The West Bank borders Jerusalem and is within rocket-firing range of Tel Aviv and Israel's international airport. The Egyptian and European sources told WND the negotiations for an Israeli withdrawal were mediated by Egypt and the European Union, with U.S. input. The sources said major changes in Israeli-Palestinian affairs are expected within a few weeks to two months. A rare personal post about the MZ blogging world. A member of the blogging community has decided to unilaterally withdraw from the MZ weblog. Yesterday, "Beak" of "Beak Speaks" became offended when I asked him to stop making repetitive, off-topic, spam postings at my site regarding his feud with bloggers "Gert" and "Greg". After seeing at his site that I am now being torched as a naive commie enabler, a bad friend who never stands up for anybody, and a bad moderator who allows villains to get away with bashing him and others, I guess it's for the best that he has chosen to pick up his toys and go home. Hopefully he will not degenerate any further into mud-slinging my reputation than he already has, but even if he does I will not be getting involved in the soap opera drama of the jilted blogger. So, we bid farewell to Beak and wish him well. Who knows what tomorrow may bring, right? Observing the corrupt state of self-loathing Marxists continue the folly of appeasing moslems while punishing Zionist Jews, plus the insanity of the treasonous inbreeds of Naturei Karta taking center stage at the Holocaust Denial Conference in Iran, I had to look at what the great Rav Kahane had said 20 years ago about the plight of a country where most nationalists are not religious enough and most religious aren't Zionist enough. It reminds me of this past week's Torah portion, Va'eira, in which Moshe is promised by God that the exile is coming to an end and the covenant of settling the Land of Abraham, Isaac and Israel is about to be fulfilled. "I appeared to Abraham, Isaac and Jacob as El Shaddai, but with My name Hashem I did not make myself known to them. Moreover, I established My covenant with them to give them the land of Canaan, the land of their sojourning...Moreover, I have heard the groan of the Children of Israel whom Egypt enslaves and I have remembered My covenant." The time is now to end the tragic, self-destructive, militant liberal secularism that is killing Israel, and wake up the galut-addicted, delusional chareidim from their blasphemous anti-Zionism, and get things turned around for Am Yisroel before it's too late. Yes, it is now more critical than ever to speedily make ourselves follow what Rav Kahane referred to as "uncrippled Jewishness and Judaism" before the vermin wipe us off the map. It won't be easy to get the secular humanists and galut-worshipping mystics to wake up from their delusion, but it's our only hope and failure is not an option. Abbas: "The dirty Jews corrupt humanity. Aim all your rifles, all of them, at the Jewish occupiers of Palestine!" Olmert: "Let's see...champagne reception with dignitaries in China, eye-lift, eliminating terrorist checkpoints, raising the Palestinian flag over Jerusalem, releasing moslem prisoners, caviar lunch with Hollywood peace activists, pedicure and mud bath at spa, expelling Jewish families from there homes in Judea...what am I forgetting? Hmmm...busy, busy,...OH YEAH! Releasing $100 million of Jewish tax payer money to Mahmoud Abbas! Silly me, how could I forget?" Ynet News - According to the plan, the money transferred by Israel to the Palestinian Authority is to be used for two purposes: Strengthening Abbas' presidential guard, and funding humanitarian needs, which will be decided by the president's office. Part of the money will also go towards strengthen the presidential guard according to the Daton Plan, which states that the money cannot be used for paying salaries, but strictly for the presidential defense establishment directly subordinate to Abbas. A few weeks ago Israel transferred NIS 40 million (roughly USD 9.5 million) to the Palestinian Authority...Israeli Prime Minister Ehud Olmert promised American Secretary of State Condoleezza Rice that he would fulfill his commitments to Abbas, and indeed, Olmert took a few steps in that direction last week. First, we had to endure Cosmo Kramer (Michael Richards) falsely claiming to be a Jew after he called black men in the audience N-GGERS during a stand-up routine in LA. Now, Jerry Seinfeld joins the Jew-bashing act himself by suing a Shabbos-observant Jewish realtor for not working on the Saturday he wanted to be shown an apartment. Arutz Sheva - American Jewish comedian Jerry Seinfeld was ordered by the court to pay a Sabbath-observant realtor her fee, which he withheld due to her not having answered her phone on Saturday. The realtor, Tamara Cohen, was unavailable when Seinfeld tried to reach her on a Saturday in February, 2005, according to the New York Post. The comedian and star of the highly successful sitcom bearing his name wanted to see a luxury apartment on 82nd street but could not get in touch with Cohen. 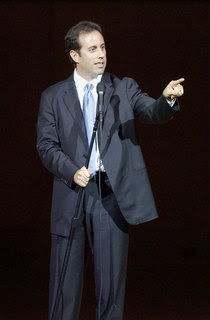 Seinfeld’s estate manager had visited the apartment with Cohen in January 2005, when the listing broker for the townhouse agreed to co-broke the house with her. On Friday, February 11, the estate manager and Seinfeld’s wife Jessica were shown the property by Cohen again. The next day, after Cohen did not answer her cell phone due to it being the Sabbath, the Seinfelds visited the apartment on their own, buying the home for $3.95 million without a broker. America's most well known Jew tries to screw a realtor out of her commission for being too Jewish. How lovely. The rest of the world must see this and think, "Damn, if the Jews themselves say observing Judaism is criminal than why the hell should we permit it?" Sick. Just sick. Liberalism is synonymous with anti-Semitism. Ehud Olmert, the elegant, well-heeled, dandy Prime Minister of Israel, returned home from his social caste enhancing sally to China knowing that he needed to do something valiant and audacious to deflect the charges of bank fraud for which he is now being investigated by Israeli police. Well, Ehud showed is mettle by gallantly braving the knife of his favorite cosmetic eye surgeon, who, by all accounts, gave him an exquisite eyelift that has made him the envy of popinjays throughout his elite clique of foppish aristocrats. The unkempt bores on the zionist right will surely be eating their hearts out when they see how fancy and opulent he looks in his lavish clothing and beautifully enhanced facial features. Israelinsider - Ehud Olmert spent 40 minutes in a private clinic undergoing plastic surgery for an eyelift (blepharoplasty) on Friday afternoon after his return from China. The Prime Minister did not inform Knesset members or the press about his plans before the procedure. However, he made an announced about the operation during the weekly cabinet meeting on Sunday. Prime Minister Olmert, who has a passion for fine pens and owns an extensive collection, has come under ridicule by the Israeli public for a posh lifestyle that is far out of reach for most Israelis. The Prime Minister, now the subject of yet another corruption inquiry, has been a government employee for almost all of his professional life and has not explained the source of his wealth. Perhaps the best way to show the moslem terrorists who's boss is to wow them with princely formal attire and deliciously glamorous cosmetic surgery. If that's the case, the Jews in Israel have never been in better manicured hands. Abbas speech: "The Jews corrupt humanity"
The PLO's Mahmoud Abbas, a "great moderate" according to all the leftwing imbeciles of mosaic persuasion, delivered a speech yesterday on the anniversary of the birth of Arafat's Fatah Party. In the speech, he called for the vermin scum he represents to raise their rifles against the Jews and quoted verses in the Koran stating that the Jews are corrupting humanity. Of course, the useful idiots of the liberal media reported only on how he spoke of laying down weapons and ending arab-on-arab violence. Arutz Sheva: In a speech commemorating the 42nd anniversary of the founding of his Fatah party, the PA chief called on Arab factions to put an end to weeks of infighting and instead fight Israel. "Shooting at your brother is forbidden. Raising rifles against the occupation is our legitimate right, but raising guns against each other is forbidden. We should put our internal fighting aside and raise our rifles only against the Israeli occupation," said Abbas in a speech in the Muqata compound in Ramallah attended by World Net Daily. Abbas' call to arms was not reported by most major media outlets featuring articles on the PA leader's speech. His statements about using rifles against Israel come after the United States, aided by Ehud Olmert, over the last few weeks provided 7,000 assault rifles and more than 1 million rounds of ammunition to militias associated with Abbas' Fatah party, according to senior Fatah militants. In Thursday' speech, Abbas went on to praise late Hamas spiritual leaderAhmedYassin, who was assassinated by Israel in March 2004. "The sons of Israel are mentioned as those who are corrupting humanity on earth," Abbas said during a portion of his speech in which he criticized recent Israeli anti-terror raids in northern Samaria. Abbas calls for the Jews to be killed and quotes the Koran saying that the Jews corrupt humanity but all the media and the leftists can report is what a man of peace he is. Olmert kisses this terrorist about the face and neck, raises the PLO flag in Jerusalem, and gives them ammunition, money and prisoner release guarantees. Condi Rice calls for Israel to eliminate security checkpoints. Amir Peretz appoints a "Palestinian" cabinet minister and tacitly endorses the Saudi plan for Moslem right of return. Oh, did I mention that Kahane was right? 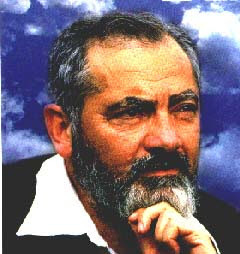 The great Rabbi Meir Kahane warned over 20 years ago that one day the vermin enemy within would be able to quietly and peaceably take over, and destroy, the Jewish State by using their massive population increases to gain greater political representation and then form alliances with the quisling leftist political parties who play the role of useful idiots. Turns out that his prophecy is now coming true. Arutz Sheva News - Israeli-Arab Raleb Majadele will take the place of Ophir Pines - who resigned two months ago because he didn't want to sit in the same government as Avigdor Lieberman, who he felt was too anti-Arab. The appointment of Labor MK Majadele as Minister of Science was decided upon Wednesday evening by Defense Minister Amir Peretz (pictured). As head of the Labor Party, Peretz has the right to choose his party's ministers - though of course Prime Minister Ehud Olmert makes the official appointment. This will probably happen on Sunday. I sit back and watch with revulsion, but not surprise, as the Corrupt State of Hellenized Marxists proceeds to dissolve the Jewish State before our very eyes. God forbid, I fear I will live to see the day when "Palestine" is born on the ashes of the failed liberal experiment known as modern Israel. I just pray for the righteous Jews in the Land who have been fighting the good fight and deserve better. There, now doesn't that feel better? Good, because that new Sunni moslem UN ambassador, the one who was tied in with the Taliban right up until 9/11, is really not good for Israel or the Jews despite your orgasmic reaction whenever PC multi-culturalism makes an appearance in the room. You remember the evil John Bolton, right? The guy who supported Israel and hated moslem terrorists at the UN much to the dismay of liberal elites everywhere? Well, this successor smells a whole lot like a Mahmoud Abbas with oil money, so stop the kvelling and adoring of his 'MUSLIM" heritage that will improve our "STREET CRED" in the arab world and protest this despicable appointment. Arutz Sheva - According to the Vice Chairman of the Conference of Presidents of Major American Jewish Organizations, Malcolm Hoenlein, “Khalilzad is considered to have a positive attitude towards Israel and the U.S.-Israel relationship.” Hoenlein, whose umbrella organization is the central coordinating body for 50 national Jewish organizations, said he expects Khalilzad to maintain the U.S.’s current policies on Israel. Actually, would someone please explain to these liberals that having a moslem pragmatist as our UN ambassador might not bode well for a JEWISH STATE that is under attack daily from MOSLEMS who unanimously want to see it DESTROYED. This move has the stench of the UAE shipping security deal written all over it. Bush is an arabist oil man first, gang. WAKE UP AND SMELL THE VERMIN! WTF? How is it possible that people still are trying to tell us that George Bush is good for Israel? The PLO, led by Yassir Arafat's hand-picked terror successor, famed Holocaust denier Mahmoud Abbas, have repeatedly said they will use all US and Israeli aid to kill Jews, and, yet, pathetic fools like Olmert and Bush keep right on pumping up Abbas and his terrorist organization under the canard that it will miraculously lead to peace and security for the Jewish State. The fact is, we all know that the moslems want to kill the Jews and take the Land of Israel for themselves. It's no secret; they say so loudly themselves every single day in mosques, classrooms, rallies and on PA television. The fact that Israel is beholden to the US and Europe because liberals are willing to sell their souls, and the lives of Jewish people, for money and popularity is truly the crux of why the Jewish State is still under moslem siege from within. Washington -- President Bush is seeking to provide Palestinian security forces under the control of President Mahmoud Abbas with "non-lethal material assistance" designed to help them provide security and regulate checkpoints. State Department spokesman Sean McCormack said January 5 the Bush administration is considering funding "on the order of tens of millions of dollars." The funds would be used to provide assistance such as vehicles, communication, uniforms and training, with the idea of building up "responsible security forces" to help prevent terror attacks and provide security in Gaza and the West Bank. Many of my loyal readers will remember when I put up a post linking to a rather colorful gentleman who calls himself "The Kid From Brooklyn". Well, another one of those moments has arrived that I feel requires his expert analysis, so, please, enjoy this brilliant fellow who really says it like it is. Go here, and make sure your speakers are turned on. You will not be disappointed, I assure you. MZ and family will be on vacation beginning today, January 2nd and returning on Sunday, January 7th. I will be checking the site and probably making a few comments until then, but this post will be the only one until we return. Be well, and remember to continue bashing the terrorist vermin while I'm gone! The picture says a thousand words. Disgraceful.